Turkey's foreign policymakers bear a greater responsibility now, after the country was elected Friday as a non-permanent member on the U.N. Security Council, or UNSC, for 2009-2010, after 48 years of absence. 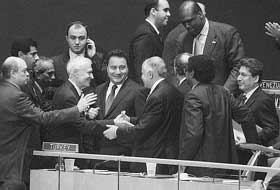 Turkey previously held a seat on the Security Council in 1951-52, 1954-55 and 1961, and will now retake its seat in January 2009. Instead of being forced to take sides on the Security Council, experts say Turkey will lean even more toward its tendency to find a middle path between contending parties, especially in the Iran nuclear row, one of the most pressing issues on the Security Council agenda. “Turkey has been playing a positive role in the region and I think that this will reinforce Turkey's tendency to not to take sides in regional conflicts and act as a mediator looking for the best of all parties,” said Hugh Pope, a senior analyst for the International Crisis Group, speaking to the Turkish Daily News yesterday. Retired Ambassador İnal Batu, who represented Turkey at the United Nations, said Turkey would not be forced to follow any particular path and would bring its own approach to regional tensions. “If we were a European Union member, we would have to act accordingly. But we are not, and just like we did not say alright to everything the U.S. demanded on Iran, we can resume doing so in our position on the Security Council,” Batu said. Fuat Keyman, a professor of International Relations at Koç University, struck a similar note. “On Iran, Turkey may choose one of two choices. One is to assume a status quo stance, which would in fact negate any significance of its membership. But it can also give weight to diplomacy and promote dialogue. I think this is the vision of the government. That's one of the factors that won Turkey the seat in the first place,” Keyman said.